Discard any number of cards. +1 Card per card discarded. Discard any number of cards. + 1 Treasure per card discarded. When another player plays an Attack card, you may reveal this from your hand. 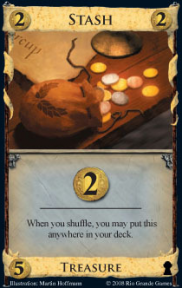 If you do, +2 Cards from your hand on top of your deck. 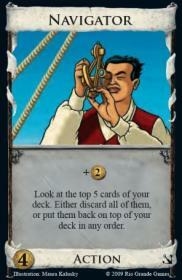 Each player (including you) reveals the top card of his deck and either discards it or puts it back, your choice. 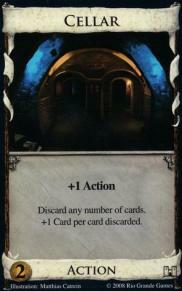 You may discard a card; if you do, +1 Action. 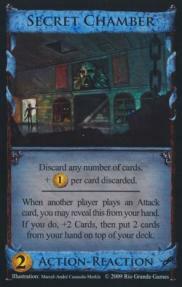 You may discard a card; if you do, +1 Buy. Look at the top 5 cards of your deck. Either discard all of them, or put them back on top of your deck in any order. 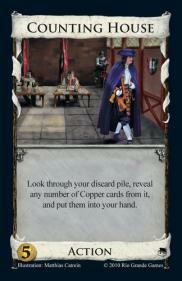 Look through your discard pile, reveal any number of Copper cards from it, and put them in your hand. 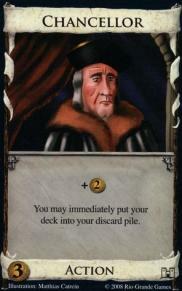 When you shuffle, you may put this anywhere in your deck. Submitted by Albert Gea on Sat, 08/30/2014 - 14:26. There are a lot of other discard cards that could potentially work in this mix. Tribute? Tactician? I would love to refine the combination further. Submitted by Albert Gea on Tue, 09/02/2014 - 10:16. Played this over Labor Day. 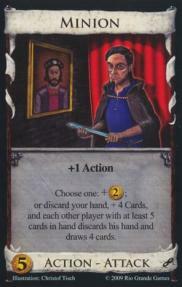 Hamlet is a bottleneck card as it is the only source of [+2 actions] and [+buys]. 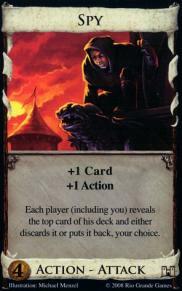 Would add another [+multiple action] card. 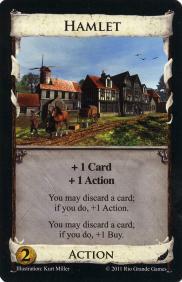 I liked the idea but Counting House and Stash were the only "power" cards that all the cycling was building towards. Needs a few more cards that interact with the discard pile from sets like Hinterlands, Guilds, and Dark Ages (which we did not have). Navigator should be replaced first. 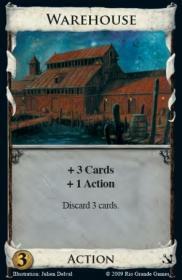 Chancellor would be a powerhouse with more [+action] and some prior [+card] (warehouse is ok for this) to set up the combo with other discard-interaction action cards.